Springsteen-tastic! Petty-rific! Okay, Virginia’s Thorp Jenson (aka Chris Ryan) isn’t the first musician to wear their influences proudly on their sleeve. It’s certain that he won’t be the last either. So the fair thing to do is to consider this record on the strength of the songs, which (eventually) stand up to a different type of comparison pretty well. Initially, however there’s none of the pounding stone cold classics Tom and Bruce deliver, despite Jenson’s attempts, amongst the early tracks. Opener Oklahoma (sit down Rodgers and Hammerstein fans, it’s not that one) speaks familiarly, of escaping small-town America. It really could be Bruce singing here, but it falls short in terms of quality and memorability. There are stronger tracks on the record that would better suit being the opener. Lonely, for instance has more urgency. Further into the piece, Lost In A Moment is a highlight – a welcome change of tempo to slow country(ish) waltz. Wake Up is good too – again a slower track, with slightly psychedelic, ethereal guitars and vocals. Jenson, it transpires, does introspection far better than he does ‘driving rock’ (for want of a better phrase). I Melt With You continues the down tempo subtleties, as does The Garden/Second Season – a sweet gurgling Hammond organ colouring the mood. It’s a record of two halves, with the second half winning out hands down. 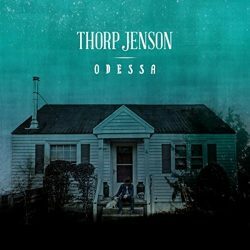 Thorp Jenson ‘s Petty/Springsteen influences mask a superior talent for country balladry, as Odessa unfolds to show us.